Four times over the past 10 weeks, I’ve made my way to Nobie’s at 2048 Colquitt on Mondays, a day when the restaurant is closed. Why? Well, believe it or not, to drink cocktails and to be one of many patrons helping bar manager Sarah Troxell practice for Speed Rack. 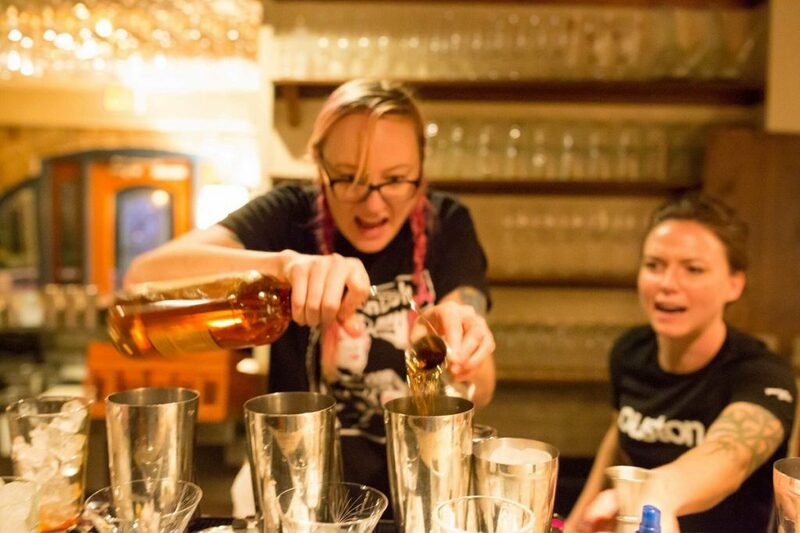 Now in its sixth year, Speed Rack is a national speed bartending competition that pits the best female bartenders against each other in timed and judged cocktail challenges. This year’s regional competition is in New Orleans on Monday, January 29 from 3 to 7 p.m. at The Howlin’ Wolf, located at 907 South Peters. Tickets are available online. Founded in 2011 by “2 BADASS OG cocktail queens” Ivy Mix (winner, Best American Bartender of the Year, Tales of the Cocktail) and Lynnette Marrero (one of Food & Wine’s Most Innovative Women in Food & Drink 2015), Speed Rack has raised over $600,000 for breast cancer charities and shined the spotlight on hundreds of talented female bartenders and mixologists. The New Orleans regional round is being live-streamed on the Speed Rack Facebook page. Troxell competed in Speed Rack last year and placed third in the regional competition, falling just short of advancing to the national-level finals. She expects to go much further this year and is the only bartender from Houston who is competing. At the practice sessions, Troxell worked on perfecting techniques to shave precious seconds off the time it takes to make four cocktails. 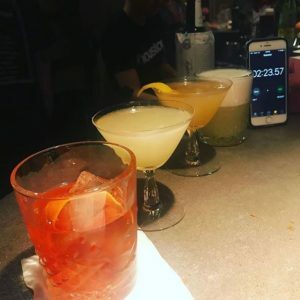 At competition, the judges call for the four cocktails at random from an approved, expansive list provided to attendees in advance. The goal is to make each as fast and accurately as possible. 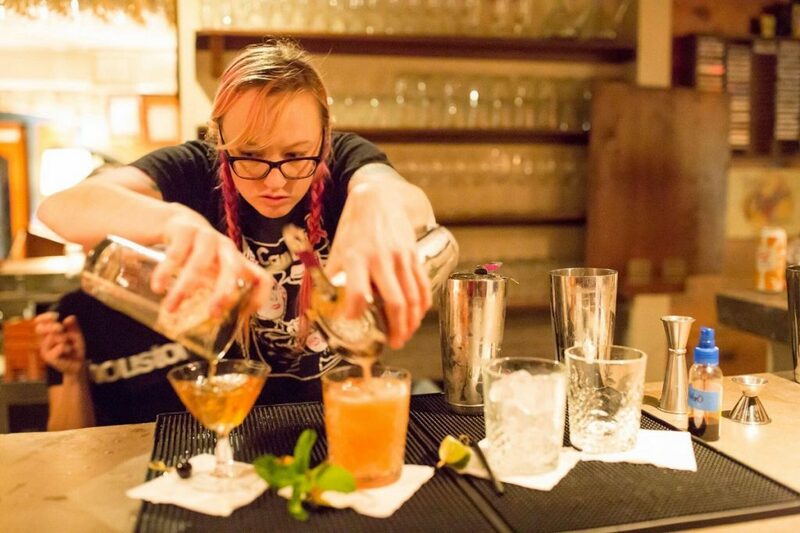 Judges issue penalties for errors such as over- or under-pouring and incorrect garnishes. Troxell is looking forward to redemption from last year, when she was a little heavy handed with the club soda while making a Singapore Sling. The penalty was the judges adding 5 or 10 seconds to the all-important time score. “Last year, I had a lot of fun getting to know the ropes of the competition and soaked up as much good energy and knowledge as I possibly could,” says Troxell. She wasn’t the only from Houston doing that, though. Elyse Blechman of Tongue-Cut Sparrow impressively took 2nd place overall in the national competition. This year, Blechman has been acting as Troxell’s coach at the practice sessions—mentoring on how to build cocktails in the correct order, whispering reminders and generally setting Sarah up for success. 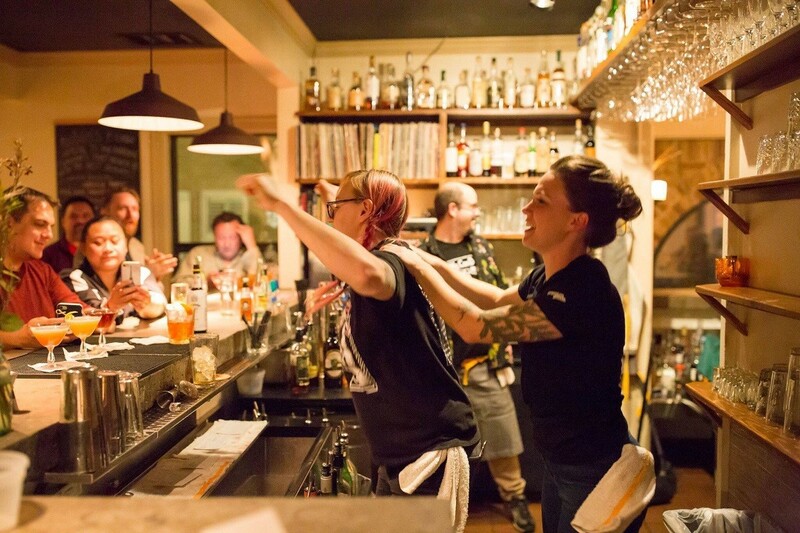 Rounding out the practice pit-crew is former Nobie’s sous chef (and newly minted Night Heron executive chef) Jacob Pate handling barback duties and gin expert Jessica Walters keeping official round time. Even for the first Monday of practice, I’d never seen anyone work so fast behind the bar while still producing a perfect cocktail—let alone four. Her time for my round that week was 2:23. Troxell wasn’t thrilled with the time (even though I had almost as much adrenaline surging through me as I did during the World Series). Blechman discussed the round with her. Mistakes were made; the top shaker tumbler wouldn’t release, and there was a pesky strainer that just wouldn’t come down perfectly flat that caused Troxell to have to re-do certain motions. All of that added time to the score—but nothing that couldn’t be fixed. At the practice sessions, I purposefully chose combinations that make for difficult sets. Large number of ingredients? Check. Egg Whites? Check. Stir two drinks while shaking the other two? Check and check. (Hey, I’m just doing my part to ensure she’s as prepared as she can be for the actual competition!) My second drink order clocked in at 2:10, the third even better at 2:06. It’s remarkable to watch Troxell make cocktails at this speed—but the difficulty of my orders were taking more than two minutes, whereas she was absolutely demolishing other rounds. Finishing four drinks in 1:45 was common. I wanted to be in the “under two minute club,” but refused to change my order. Troxell didn’t bat an eye—she took a few moments to strategize, and put her hand on the Staples Easy Button comically placed next to the prep area and took a deep breath. I’m such a “good patron” that I took the opportunity to remind her that she hadn’t broken the two minute barrier for my order. “Don’t worry. I’m going to crush it,” she said. I distinctly remember Kesha’s “Woman” playing over Nobie’s hi-fi speakers. She slid my Old Fashioned over at 1:56 and the crowd cheered. Way to go Sarah! Best of luck kicking everyone’s slow butts!